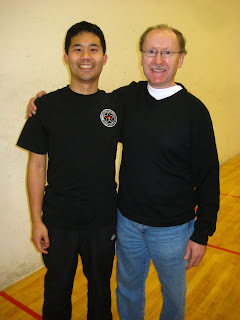 I was particularly excited leading up to this seminar by Sifu Ralph Haenel of Wing Tsun Kung Fu Vancouver. 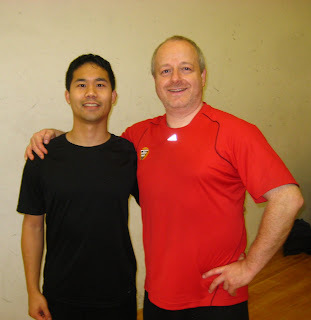 During the summer training with Sifu German Ferrer of Wing Tsun Calgary, my WT addiction had exponentially increased. In seminar reviews, I usually focus on training themes and ideas. 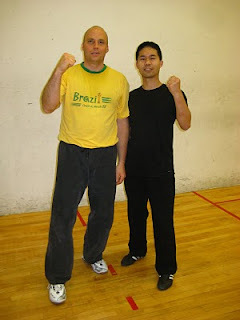 This time, I will also describe some different yet equally important aspects of training (and teaching) martial arts. It was great to see many people take time out of their busy lives to attend the seminar. Some switched weekend shifts. Others arranged time away from their children. Another drove from quite a distance. In fact, the student who lives 6-7 hours away not only came for both the bonus class and the entire weekend seminar, but also drives regularly to Calgary each month for a morning of private lessons! What does this say about the Wingtsun Kung Fu as taught by Sifus Ralph and German during classes and private lessons? But, I can’t do a WT seminar review without mentioning something physically related! Scenario as commonly laid out in WT seminars: you are unexpectedly facing an aggressive attacker. You have solid smooth footwork, a fluid upper body, limber arms, everything. You evade the threat, get into the opponent’s core, and punch! Yet, nothing happens. Uh-oh. The aggressive attacker, is… well, still aggressive or even more so now. Yes, everything was there, except power! Once again, the importance of training punching power was evident throughout this seminar. To aid in this development, students were introduced to different training exercises that were done either fast or slow, and worked on either fluidity or structure. All of the exercises helped understand where effective punching power comes from and also how to generate it. Remember the soft sardine strike? One thing students may take for granted is the openness of teachers to questions and queries. Sifu Asad always pauses often for any questions and feedback during classes and private lessons. Sifu German is also more than open to any ideas and thoughts, with an uncanny ability to engineer (pun intended) different drills to make a point. 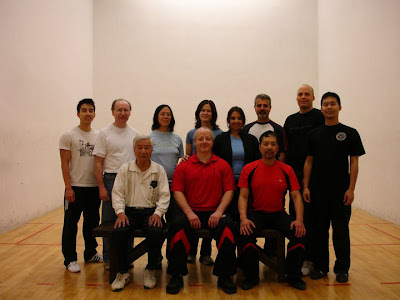 During any private lessons or group classes, Si-Fu Ralph always asks for any questions or queries. To back up that offer, he is able to explain an answer in different ways depending on the student’s understanding. During class, he walks around often and gives students constant feedback and suggestions on how to improve. Check out his recent blog post about teaching. These three teachers also have another thing in common. To balance any spoon-feeding, they have also allowed students to grow and discover things on their own. The WT structure is built in such a way that this can actually occur! In my previous post here, I mentioned that 2010 would be a good year for WT, and boy have I been right so far. Thanks for the Blog on this recent seminar that I missed! I feel guilty now that you tell me someone drives 6-7 hours regularly for lessons & even privates! But really I am at the mercy of my job right now. You are right about Sifu Ralph teaching in a manner that each student will understand and remember in his or her own mind - I still remember his little phrases and maxims that he created just so I would remember - that is the mark of a true Teacher and master of guidance. He truly is a confidence coach. Regarding power - I found it only comes from the regular / daily use of the wall bag - do not use sand (I use flax seed) and be sure to use knuckle gloves i have some that are no padding just cotton / lycra. Great Blog!!! All my respect to the Sifu's. We've been using interesting drills to develop the right flexible power, minus any wall-bag work, with success. It'd be awesome if you were able to visit WT Calgary again to train with us!